Sea Lettuce is named because of its resemblance to green leaf lettuce both in color and the appearance of its leaves. 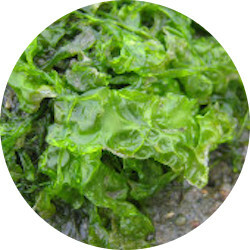 Sea Lettuce has a distinctive flavor and aroma. This sea vegetable has excellent flavor when consumed raw and has a slightly bitter taste if cooked alone. The?whole dry leaves of Sea Lettuce can be torn or cut up with scissors and eaten in soups and salads. Sea lettuce is harvested and enjoyed worldwide and is common in temperate and colder seas. We sustainably harvest and handle our Sea Lettuce that is certified organic and we voluntarily test for heavy metals, chemicals and microbiological contaminants. Sea Lettuce is very high in iron and protein, similar to that of Dulse, and it is also high in iodine, aluminum, manganese and nickel. Like most of our sea veggies, Sea Lettuce provides considerable amounts of dietary fiber (31%). And it is sun-dried so it is totally RAW!